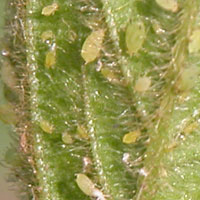 Soybean aphids are vectors of the Tobacco Ringspot Virus. Tobacco ringspot virus (TRSV) is another soybean virus found in the North Central states. Of the many diseases caused by TRSV, budblight of soybeans is one of the the most severe. In general, most significant yield loss occurs when plants become infected before flowering. The primary source of TRSV in soybeans is not clear. Seed transmission occurs, but at a very low rate.The dagger nematode can spread TRSV to some host species as it feeds, but transmission efficiency to soybean is low. Several insect vectors have been reported, including aphids Myzus persicae and Aphis gossypii , grasshoppers, the tobacco flea beetle, and thrips. However, these insect vectors are also not efficient vectors of TRSV. Additional research is needed to find out how virus can spread in soybeans more rapidly than expected through the activity of inefficient insect or nematode vectors, and the low amounts in seed. Yields are most affected when bud blight occurs. Losses are greatest when young plants are infected before flowering, or when fields are planted with TRSV-infected seed. Yield losses of more than 25% can occur under these conditions. Yields are also lowered through reduced pod set and seed formation. 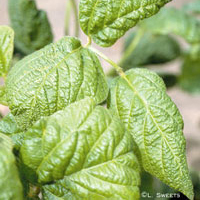 An example of bumpy, rugose leaves. Plants infected in early growth stages become stunted and will likely remain green after a severe frost. The most characteristic symptom is the shepherd's crook caused by the curving of the terminal bud to form a crook. Later, other buds on the plant become brown, necrotic, and brittle. Adventitious leaf and floral buds may proliferate excessively. Leaflets are dwarfed and may cup or roll. Leaf blades may be mottled, or bumpy (rugose) and bronzed. Pods are generally underdeveloped and often aborted. To determine if a virus problem exists in your field, look for the following signs. Foliar symptoms of virus infection will be most apparent during times of rapid growth and cooler weather. Resistance to TRSV has been identified in Glycine soja but is not known in the cultivated soybean, Glycine max. The use of virus-free soybean seed seems appropriate for disease control although it is not clear whether this is a significant way to solve disease problems. Avoid planting in fields that are known to be infested with the dagger nematode. Avoid planting soybeans adjacent to mixed legume fields.